Buy a raffle ticket, help DC Central Kitchen! I try not to beat the drum too hard for charity, because constant demands for donations and stuff tend to be tedious, but this one is too good not to talk about. So What’s the Deal and We Love DC (and also ARLNow.com, K Street Kate and EatMore DrinkMore) have teamed up with area charities to hold an awesome Raffle & Silent Auction. A $5 donation to DCCK through their charity page at So What’s the Deal gets you a raffle ticket, and $10 gets you three. The prizes? Pretty awesome: $20 gift cert to Ping Pong Dim Sum, $10 at Lounge 201, $25 to Playbill Cafe, a subscription to Washingtonian Magazine, tickets on the Boomerang Bus, a dozen cupcakes from Curbside Cupakes, a $50 gift cert to Vapiano, and still more. Better yet? The blog that raises the most charity gets their donation matched by So What’s the Deal. Go grab a raffle ticket. 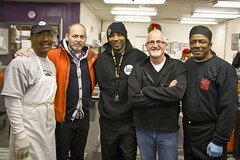 $10 means lunch to you, but it could be a job for someone through DC Central Kitchen.